Annotated bibliography (K-12 resources) from the Anthropology Outreach Office, Smithsonian Institution. Annotated bibliography including books, journal articles, dissertations, videos, sound recordings, and more; from Appalachian State University Libraries. Section in the bibliography (unannotated) presented by Prof. Jon T. Kilpinen, Dept. of Geography, Valparaiso University. Bibliography with brief annotations from the Internet School Library Media Center (site administrator: Inez Ramsey, Professor Emeritus, Library Science Program, James Madison University). Annotated bibliography from the National Museum of the American Indian, Smithsonian Institution. Annotated bibliography from Prof. Donald N. Panther-Yates, Dept. of English and Foreign Languages, University of West Florida. Prepared independently by reference librarian Anne Gometz. Annotated bibliography from the Alabama Dept. of Archives and History. Click "Recommended Reading" for an annotated bibliography from the Trail of Tears Monumental Painting Project. Valuable if not essential resource for comparing the physical environments of the five tribes before and after Removal, with ecological descriptions and photographs of each region. Another factor in comparing the tribal regions before and after Removal; from the U.S. Geological Survey and National Park Service. Choctaw, Creek, and Seminole before Removal. Cherokee and Chickasaw before Removal. Eastern Oklahoma: Cherokee (Ozark) and Choctaw (Ouachita) tribal regions. East central Oklahoma: Creek, Chickasaw, and Seminole regions. Map and brief descriptive list from the Oklahoma Dept. of Wildlife Conservation. Map and brief description of twelve cultural divisions of Native Americans in North and Middle America; from the website American-Indians.net. THE U.S. GENWEB PROJECT (Rootsweb): genealogical site with state-based "genwebs" that contain historical overviews, research links, and, not to be overlooked, county and family histories. THE FIVE TRIBES BEFORE REMOVAL, including legends; also see the official tribal sites and USGenWeb sites, above. Overview of history, language, settlements, agricultural and hunting patterns, political and social organization, religion, and more from Chuck Smith, Dept. of Anthropology, Cabrillo College (CA). Brief overviews from the Ocmulgee National Monument (Georgia), National Park Service. 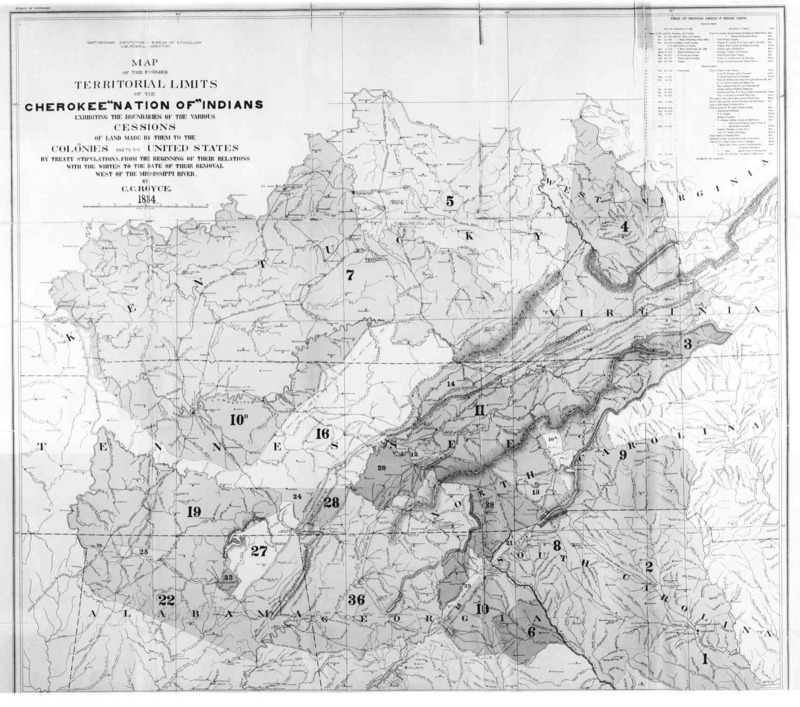 Brief overview of Cherokee villages and life in the Appalachians; from the North Carolina Division of Archives and History. Historical overviews from the site About North Georgia. Article by Michael White, presented on the website Historic East Nashville. On the personal website of Ken Martin, a Cherokee. Academic paper, "Rethinking Cherokee Acculturation: Agrarian Capitalism and Women's Resistance to the Cult of Domesticity, 1800-1838," by Prof. Wilma A. Dunaway, Department of Sociology, Virginia Polytechnic Institute and State University, 21 American Indian Culture and Research Journal 155. Article from A Concise Dictionary of Indian Tribes of North America (1979), on the site of the University of Tennessee at Martin Libraries. Collection of letters, treaties, and other primary materials compiled by K. M. Armstrong, a Chickasaw, on his personal website. Choctaw History, Villages, Legends, etc. Extensive and useful collection of resource materials compiled by Michael Boucher, a Choctaw. List of web resources compiled by Kathleen Manley Nystrom for her family history website. Article "Mushulatubbee and Choctaw Removal: Chiefs Confront a Changing World," by Greg O'Brien, Dept. of History, University of Southern Mississippi, in Mississippi History Now online. Rich resource of annotated weblinks, including maps. Brief intro from the Alabama Dept. of Archives and History. Includes discussion of environmental factors in the Creek culture; from the web site TexasIndians.com. Online text of Reminiscences of the Creek, or Muscogee Indians, contained in letters to friends in Georgia and Alabama, by Thomas S. Woodward, 1859; on the personal website of Jim Upchurch. Overview from the National Indian Festival Association (on a personal website). Helpful Q&As from a personal site on Creek history. Academic publication, "The Southern Fur Trade and the Incorporation of Southern Appalachia into the World-Economy, 1690-1763," 1994, by Prof. Wilma A. Dunaway, Department of Sociology, Virginia Polytechnic Institute and State University. To access more online resources on Indian Removal, conduct web searches with key phrases "Indian Removal," "Trail of Tears," "Indian Territory, Oklahoma" and individual tribal names (with "Nation," as in "Choctaw Nation"). From the PBS site "Africans in America." On the site of Cape Girardeau, Missouri. From the Museum of the Red River, Idabel, Oklahoma. Note: There are limited online resources about the environmental, agricultural, and economic history of the five tribes, as a whole, after their settlement in Indian Territory. One rich source of anecdotal information is the Oklahoma county histories and genealogical resources at OKGenWeb (http://www.rootsweb.com/~okgenweb/) and the county listing by tribe at http://www.rootsweb.com/~okgenweb/okprojects/). Other resources are listed below. Based on research from the Oklahoma Historical Society. Brief discussion in "Agriculture, Indians, and American History," by Thomas Wessel, Agricultural History, Jan. 1976; on the site of the College of Agricultural and Life Sciences, North Carolina State University. Collection of primary sources and background materials prepared in a class project in collaboration with the Digital Scriptorium, Special Collections Library, Duke University. Article "Tribal land to private land: A century of Oklahoma Choctaw Timberland Alienation," by Sandra L. Faiman-Silva, Journal of Forest History, October 1988; on the personal site of Choctaw Michael Boucher. Includes resource-rich family histories of Choctaws who settled in east Texas before and after Removal of the 1830s. Brief section on the Chickasaw agriculture and business after Removal; from the University of Tennessee, Martin, Library. Timeline with several events relating to the five tribes after removal; entitled "The Unassigned Lands of Oklahoma Territory" (six counties in central Oklahoma). First section of this excerpt from "The Indian Country," The Century Magazine, August 1885; on the family website of the Yearwoods, Edmond, Oklahoma. Clear overview with bibliography; by Ann Maloney on Rootsweb. Maps, documents, and photographs in this teaching lesson from the National Park Service (Honey Springs Battlefield, Oklahoma). On the former slaves and free persons of color in the "Five Civilized Tribes," from the African-Native American History & Genealogy Web Page. --Theodora R. Jenness, "The Indian Territory," The Atlantic Monthly, April 1879. --W. D. Crawford, "Oklahoma and the Indian Territory," The New England Magazine, June 1890. --Senator Orville H. Platt, "Problems in the Indian Territory," The North American Review, February 1895. Use menu to select tribal manuscript collection guides (not digitized), which provide organizational structures for researching the five tribes. From the Smithsonian Institution, 1967, on the site of the Native American History Archive from Teachers College, Columbia University. 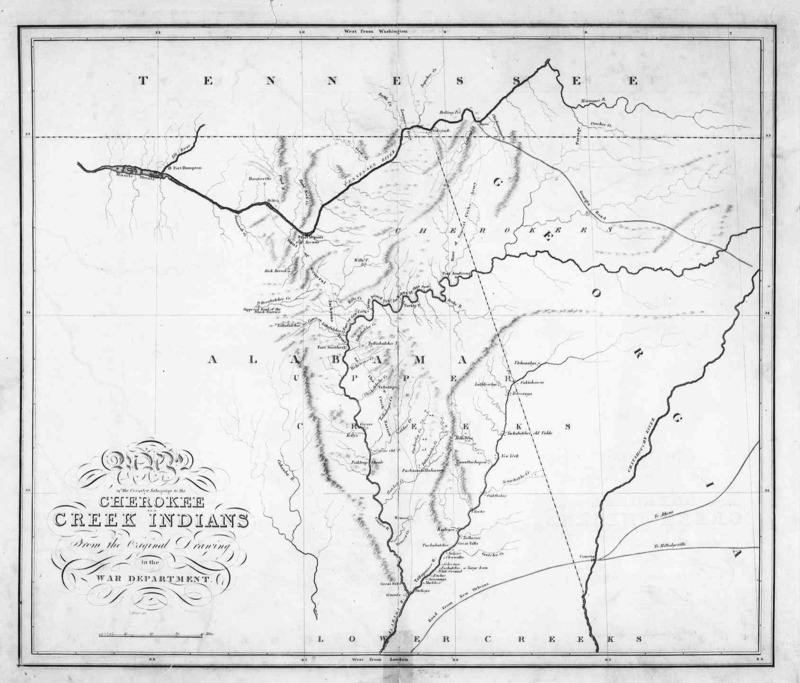 Series of maps depicting the progressive loss of Cherokee land before Removal; on the personal site of Ken Martin, a Cherokee. Entitled "A New Map of Georgia," with tribal lands identified; from the Hargrett Rare Book and Manuscript Library, University of Georgia Libraries; home page of Map Collection at http://www.libs.uga.edu/darchive/hargrett/maps/maps.html. Entitled "Mississippi Territory," with tribal lands identified; from the Hargrett Rare Book and Manuscript Library, University of Georgia Libraries. 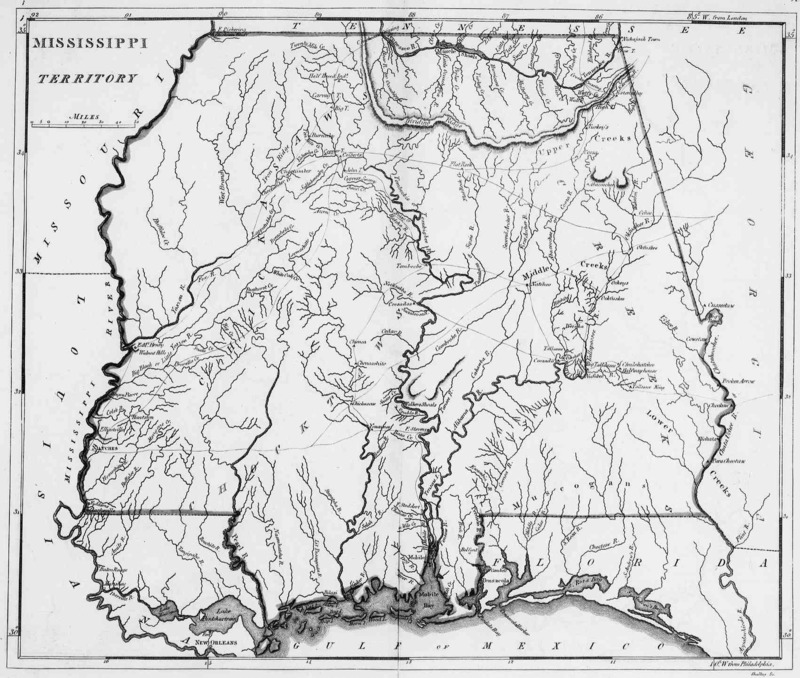 Map "according to John Melish," with tribal land boundaries; page from a publication of the Alabama Dept. of Archives and History, placed on a geneological site for Washington County, Alabama. From the Hargrett Rare Book and Manuscript Library, University of Georgia Libraries. Entitled "A Map of that Part of Georgia Occupied by the Cherokee Indians,1831," from the Hargrett Rare Book and Manuscript Library, University of Georgia Libraries. 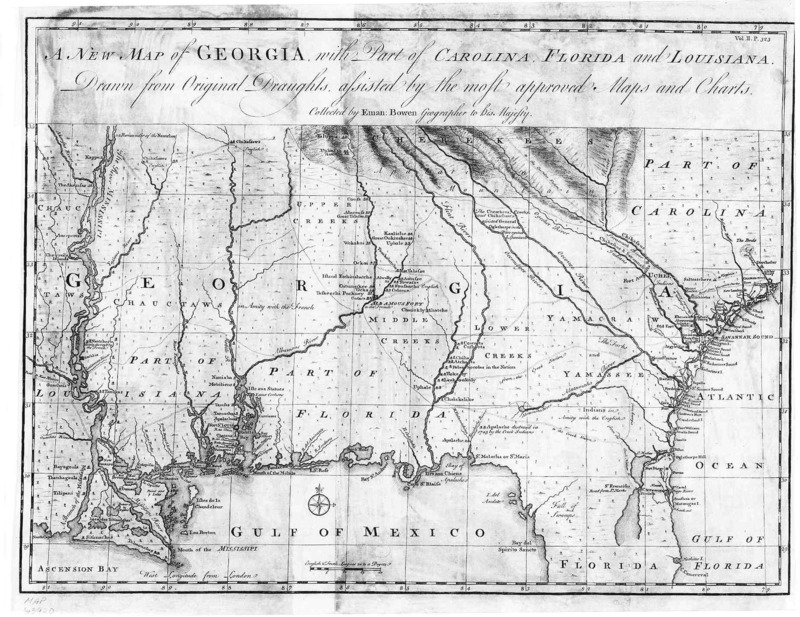 Black and white map, from the Hargrett Rare Book and Manuscript Library, University of Georgia Libraries. Detailed map from Hardesty's Historical and Geographical Encyclopedia,1884; from the Perry-Castañeda Library Map Collection, University of Texas at Austin. At this page, which presents the Alabama map, click "To see all pages [state maps], click on the image [of the Alabama map]. 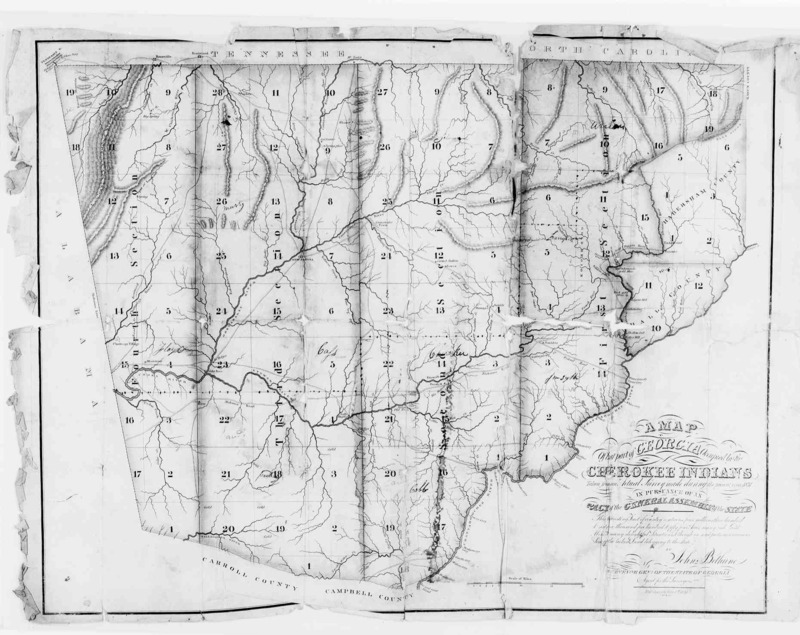 Proceed to Alabama (northern portion), Florida, Georgia, Indian Territory (1-3), Mississippi, North Carolina, Tennessee and Bordering States, Tennessee (detail), Tennessee and Alabama (portions of); from the Library of Congress. From the McClung Museum, University of Tennessee, courtesy of the National Geographic Society. From the Museum of the Cherokee Indian, North Carolina. From the Trail of Tears Monumental Painting Project. 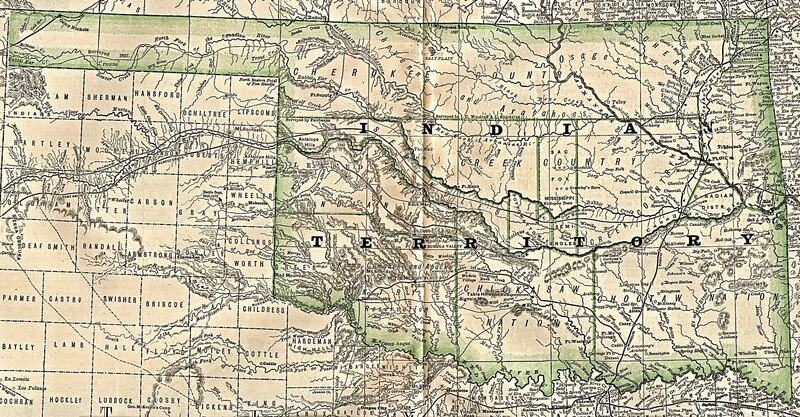 At this home page of the Library of Congress online collection "Map Collections, 1500-1999," conduct a subject search for "Indian Territory" to access six maps from the late 1800s. From OKGenWeb (The U.S. Gen Web Project). With former Indian nation boundaries and present county boundaries, from OKGenWeb. More historical and current maps from OKGen Web. Shaded relief maps from the online Color Landform Atlas of the United States (Ray Sterner, Johns Hopkins University, Applied Physics Laboratory). Bibliography from the Anthropology Outreach Office, Smithsonian Institution. Hundreds of summaries of American Indian legends, from the online Encyclopedia Mythica (Native American mythology advisor: Prof. Gerald Musinsky, Temple University). An account of the captivity of Elizabeth Hanson, now or late of Kachecky, in New-England: who, with four of her children and servant-maid, was taken captive by the Indians, and carried into Canada: setting forth the various remarkable occurrences, sore trials, and wonderful deliverances which befel them after their departure, to the time of their redemption, by Elizabeth Hanson and Samuel Bownas, 1760. From Early Canadiana Online. A narrative of the captivity and sufferings of Benjamin Gilbert and his family: who were surprised by the Indians and taken from their farms on the frontiers of Pennsylvania in the spring, by Benjamin Gilbert, 1780. From Early Canadiana Online. Memoirs of a captivity among the Indians of North America, from childhood to the age of nineteen: with anecdotes descriptive of their manners and customs. To which is added, some account of the soil, climate, and vegetable productions of the territory westward of the Mississippi, by John Dunn Hunter, 3d ed., 1824. From the site Voices of 19th-Century America from Dr. Pat Pfleiger, Dept. of English, West Chester University of Pennsylvania. A narrative of the captivity of Mrs. Johnson: containing an account of her sufferings, during four years, with the Indians and French, by Susanna Willard Johnson Hastings, 1827. From Early Canadiana Online (1875 edition also available at the site). Nine years a captive, or, John Gyles' experience among the Malicite Indians, from 1689 to 1698, by John Gyles and James Hannay, 1875. From Early Canadiana Online. Life of Tecumseh, and of his brother the prophet: with a historical sketch of the Shawanoe Indians, by Benjamin Drake, 1841. From Early Canadiana Online. Delivered to the Choctaw and Cherokee tribes before Removal; on the site First American Forefathers created by Tacha Hanhepi Wi ("Moon Deer"). List with brief annotations from the Anthropology Outreach Office, Smithsonian Institution. List of published resources from the Association of American Indian Physicians. Searchable database from Dan Moerman, Professor of Anthropology, University of Michigan, Dearborn. Research guide from the Appalachian State University Libraries. From the Cherokee Cultural Society of Houston. Excerpts from six historical sources, on a family genealogical website. K-12 web materials compiled by the Native American History Archive, Teachers College, Columbia University.